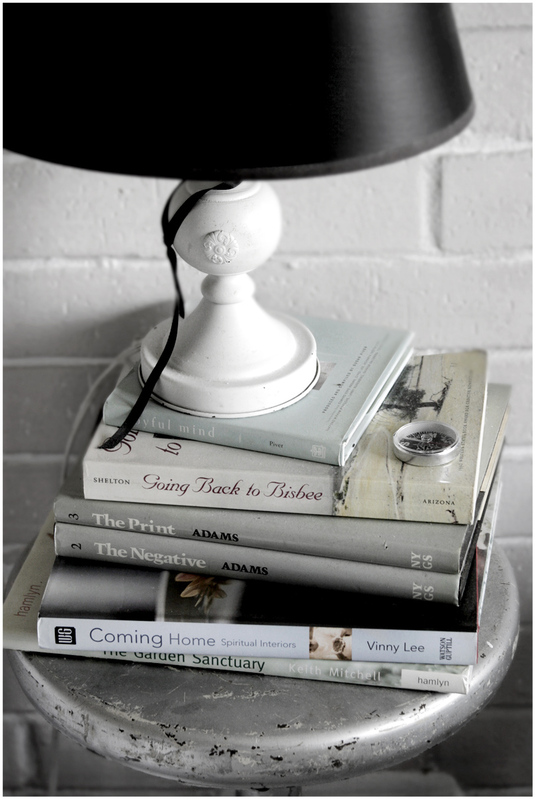 see that black ribbon wrapped around the lamp? the price tag was tied on with that ribbon back when i bought that lamp, 10 or 12 years ago, in a local antique mall that had once been a department store a million years ago, and when you went in you could smell the history of old cash registers and handwritten lay-away tickets, and there were stairs that held the curve of all the footsteps they'd seen, and it had that great smell of old wooden floors and was one of my favorite places to while away an hour or two. it was only 5 minutes from my house and now it is an office complex. i never took the ribbon off because the lamp looks great with that ribbon; it's still got the knot that was tied by the woman who sold it to me, still got that history of her touch, i never did anything but slip off the price tag. i liked the way the ribbon fell back into place. see that silver stool? that's an old photographer's posing stool, it came from a photographer up in greenville, texas, an old customer of ours, about whom i could tell you stories. like the time he couldn't find a roll of film he'd shot - he'd driven all the way down from greenville, knew he had it, couldn't possibly have forgotten it, i think it was one of the rolls of a wedding he'd photographed, it was something not re-shootable, i remember that - so he pulled his car up to the dumpster outside and started cleaning it out, and it was a big car, a big old brown car, and we watched as things flew into the dumpster - papers and cups and pens, he just started tossing - and sure enough, after a while, he found the film and in he came, sweating and tired and not in the least embarrassed or chagrined or anything, just glad that he'd found the film and probably a little glad he'd gotten his car cleaned out also. he retired a few years later and brought stuff down to see if we wanted to buy any of it or could sell it for him, and he had this stool i immediately lusted over. the ever-wonderful michael bought it along with a bunch of studio lights and stands and tripods and photography whatnots, and i immediately confiscated the stool to sit beside my desk, to hold papers. michael would sometimes steal it away and take it back to the studio, but i always stole it back and eventually i brought it home, because, like i said, i lusted over it, and there was no way around it. i still do, it's one of my favorite things in my house and sits against the wall, between the couch and a chair. i don't know what has become of the photographer, but I am reminded of him every time I see this stool. the books are there mostly for the colors they are, although the 2 ansel adams books always make me smile because they once belonged to a friend of mine, either him or his ex-wife, both photographers - when they got married they had lots of duplicate books and cameras they thought they didn't need 2 of, so they brought them to the camera store where i used to work until michael made me an offer i couldn't refuse, and they put them for sale in our used and consignment section and i bought these 2 books and a little olympus camera. they later got divorced, and now that i think about it, i guess these books were hers because i think i've seen his on his bookshelves, and there's a lesson to be learned there somewhere; his current wife is not a photographer and they didn't have any duplicate anythings, so all's well in the marriage. the little olympus camera was stolen when someone broke into my house and took all my watches and cameras and a gun and a bunch of mexican coins in an antique purse and 80 dollars cash. i missed the purse and that camera the most and luckily my house was clean so that when the police came and dusted for prints i wasn't embarrassed or chagrined or anything. atop it all, a compass. i keep it pointed north. I do this, too; arrange things in my home &/or studio. It could be conceived of as an "artistic rendition" but it is always like yours: a layer cake of memory & meaning...I pass by it a hundred & thirty two times without thinking of it. Then I'll look & see & remember; & it is as current, fresh & poignant as when I first arranged it. i love this, how objects connect us to people and places or the memories of them. 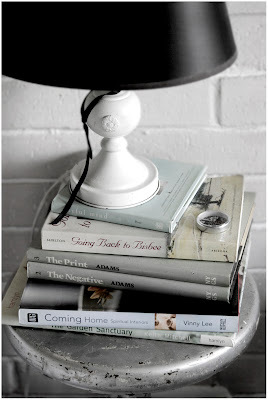 A beautiful vignette and I totally get the string on the lamp. It reminds of an old pair of shoes I had that picked up a tack in the sole one day. I somehow became attached to it and could never pull it out. One day while in class at college someone pointed it out to me and I said " oh yes that's my lucky tack." this could totally be a chapter in a book...you know that right ?...if not, let me bang that into your head....THIS COULD TOTALLY BE A CHAPTER IN A BOOK ! and my compass....north, too ! i agree with Beth - a chapter in a book. love the touch of the compas - pointing north of course. beautiful tones in this photo. ps i buy books for their color much of the time. a lovely story...I just finished dusting, and vacuuming myself(got a new one!) But so right, they just don't make things like they used to and it is the history of things that connects them to us. Their stories live on through our lives, and give us meaning, and sometimes, direction. lovely to have a peak into your life and the tales behind the things you live with. yes, i also agree about the chapter in a book nudge, dear debi. i love the way you remember things and hold on to what's precious and meaningful. you inspire me SO SO much!!! They look lovely together, you have a great eye. I know the store you speak of, and I miss it too. That stool is to die for.